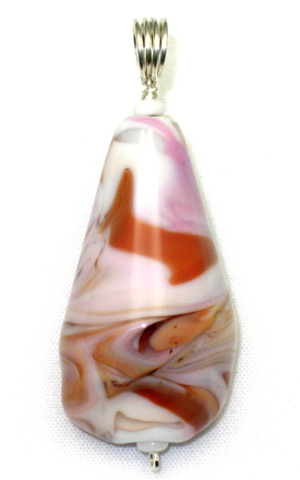 This round teardrop shaped pendant bead has a white base partially covered with several shades of opaque and transparent pink along with just a bit of transparent pale lavender. The molten glass was then manipulated with a pick and paddle to produce the shape and patterning. As a final step, “creases” were pressed into the molten glass at the bottom for added texture and interest.